Kentucky Farm Bureau President Mark Haney (center) shared a light-hearted moment with Senate President David Williams (left) and Governor Steve Beshear (right) during today’s “Measure the Candidates” forum at the KFB state office in Louisville. Kentucky Farm Bureau’s Board of Directors met today with gubernatorial candidates Steve Beshear and David Williams to discuss positions on issues affecting the state’s agriculture industry, farm families and rural communities. 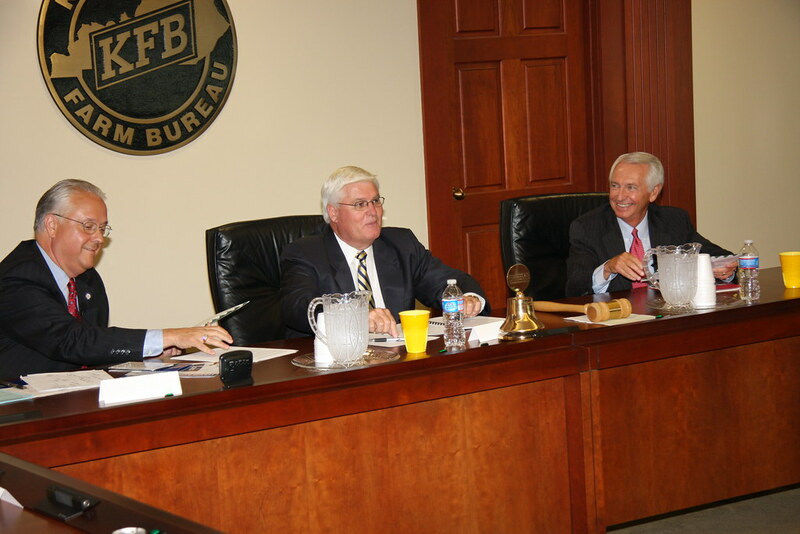 Governor Beshear (D) and Senate President Williams (R) fielded questions from the KFB leaders and explained their positions during the two-hour meeting at the farm organization’s state office. It marked the first time the two have appeared jointly at an event during the general election campaign. KFB President Mark Haney said the meeting gave the organization’s leadership an opportunity to gauge the differences between the two on the organization’s key issues. Both Beshear and Williams come from rural communities. They expressed a strong commitment to agriculture and an appreciation for Kentucky Farm Bureau. Both candidates pledged continued support for the state program that over the past 10 years has invested hundreds of millions of dollars of Tobacco Settlement funds toward agricultural development projects. They also agreed with KFB policy calling for the development of biofuels and other energy projects involving the utilization of farm products. They voiced opposite positions in regard to the state’s tax system and expanded gaming. Williams repeatedly called for overhauling the state’s tax code while Beshear said on several occasions that the National Tax Foundation has given Kentucky a favorable rating for “tax environment.” The governor said he was not advocating any broad-based tax increases; Williams also decried tax increases and vowed to put together a commission to recommend reforms to the state’s tax system. Among many issues, the candidates were questioned about their positions on agricultural marketing and development, fiscal policy, energy, transportation, education and environmental issues. Visit our Youtube Channel to watch the Measure the Candidate forum.